Since 1971 the Pro Oriente Foundation has initiated unofficial contacts between Catholic and Eastern Orthodox theologians. At the end of the twentieth century, the Eastern Assyrian Church has also been engaged in such a dialogue. In this paper Rémi Gounelle shows that it is the reason why the condemnation of Nestorius by the Ephesian Council in 431 had to be reconsidered by the members of this Foundation. The final declaration of the Third Syriac Colloquium offers a renewed vision of the troubled period of early Christianity. 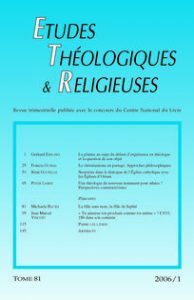 Rémi GOUNELLE est professeur d’histoire du christianisme ancien à la Faculté de théologie protestante de l’Université Marc-Bloch (Strasbourg II).